The current Czech republic has had a tumultuous history, but its inhabitants have always distinguished themselves as great engineers. This small part of eastern Europe has played an important part in automotive history, bringing forth marques as Aero, CZ, Laurin & Klement, Praga, Skoda and Tatra. Praga is one of the lesser known eastern European manufacturers, but it boasts a great history. 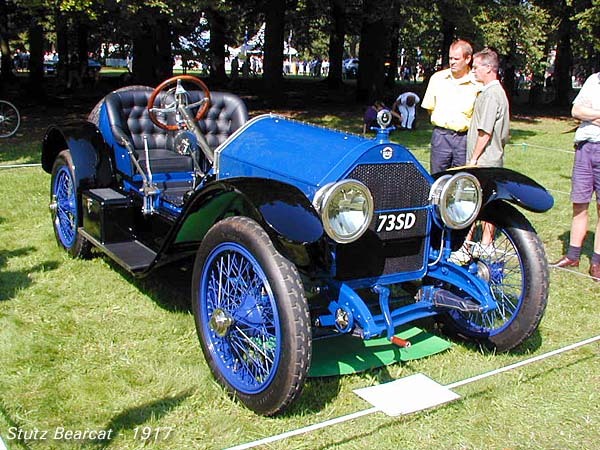 The start of the company hails back as far as 1907, commencing with the production of cars under license of Fraschini. In 1912 the first self designed car left the factory: the luxurious "Grand" model. Praga's heyday was between 1919-1940, manufacturing a wide range of vehicles. In that era Praga's main and best known car model was the Piccolo, a relatively compact middle class car sold on some export markets as the Minor. It was a high quality car which was revised frequently over the years. On the picture you see a 1931 Praga Piccolo 202 4-door sedan model. It featured independent front- and rear suspension, four wheel brakes and a comparatively small 4-cylinder 996 cc 4-stroke engine. Until WW2 Praga offered a complete range of cars, starting with the small "Baby" model, through middle class models as the Piccolo, the Lady and the Mignon up to big luxurious cars as the Grand and the Golden. After the war car production was abandoned in favor of trucks and gearboxes. The Praga company is still in existence today, manufacturing, among other things, trucks and motorcycles. A contrast to the Praga in name familiarity, but not so much in quality, is Rolls Royce. Here you see a wonderful price-winning 1929 Phantom I with extravert open tourer bodywork by Barker. This car was originally delivered to South Africa, where it was used for a long period. To cope with the African heat this Phantom has adjustable louvres in the monumental Rolls Royce radiator grill. I particularly like the polished metal body parts on this car. 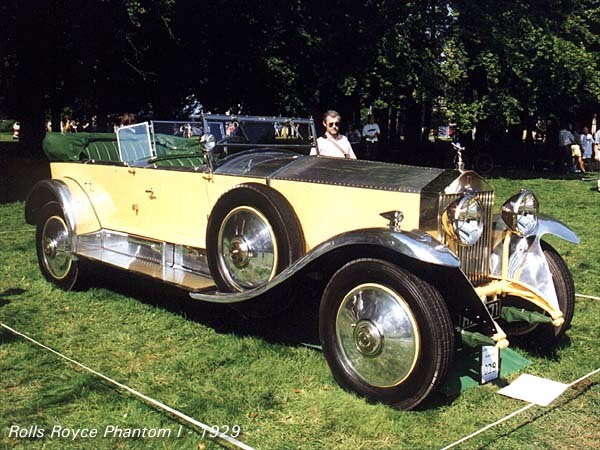 The stately Phantom I model was introduced in 1925 as a replacement to the Silver Ghost. It wasn't a big success because of its old fashioned engineering and its lacking driveability. As a result it was replaced in 1929 by the Phantom II. Unlike the rest of the Phantom I its engine was quite modern; it was a big 7668 cc 6-cylinder in-line unit with overhead valves, in later versions with an aluminum cylinder head, that offered some 100 hp and a maximum speed around 120 kph. Needless to say that a car like this is very valuable today. The Phantom II was replaced by the Phantom III in 1935. It was designed to compete with the big American luxury cars of that period and featured a V12 engine. The 1937 Rolls Royce Phantom III shown here is fitted with an elegant Sedanca de Ville bodywork by Inskip. 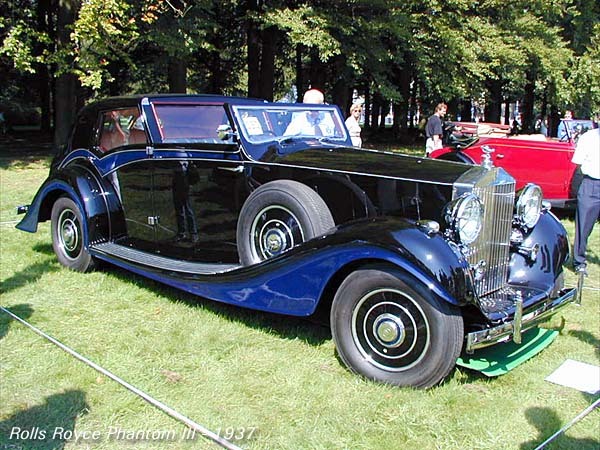 The stately and very expensive Phantom III was a meticulously engineered car that offered independent front suspension (not unlike the contemporary Cadillac system), a roomy passenger compartment and a smooth silent ride. The impressive 12 cylinder engine had a 7340 cc capacity and featured a central camshaft with hydraulic valve tappets and a double ignition system. It comfortably pushed the car to a 148 kph maximum speed using its 165 hp. Only 704 Phantoms III have been made; the production of these cars was ended by WW2. Jumping to another great marque: the American Stutz. The Stutz company started out in 1911 and made its name building sports cars. The most famous Stutz model of all was the Series E Bearcat; a very rudimentary racer of great potential that appeared in 1914. The Bearcat enjoyed a lot of success on the American racing scene with most notable results achieved by the White Squadron, a team of gentleman racing drivers. In the national American racing championship of 1915 the White Squadron took 1st and 3rd place driving Stutz Bearcats. Bearcats were powered by engines made by the Wisconsin company. Engine types could vary, depending on the wishes of the customer, but most common were 4-cylinder bi-block engines with 6837 cc capacity and 60 hp. These cars could top 130 kph, very competitive for that time. Other features of these Stutzes were a transverse gearbox system (combined with the rear axle) and the extensive use of aluminum parts. The last sporty Bearcat left the factory in 1924, but purists consider the Bearcats built between 1914-1919 as the real thing. It's rare to see one in Europe, so it was a nice surprise that the 1917 Stutz Bearcat on the picture was displayed.